If you have been following me (@annajayne) on Twitter, you may have noticed me talking about something called "VisualLintGui". This is actually the second of two projects (the first being VisualLintConsole - the command line version of Visual Lint) we got underway after the release of Visual Lint 3.0. Although it has been fully functional in terms of analysis functions for quite some time, until recently we were not able to devote a great deal of time to the details of its user interface. That has now changed, and since February VisualLintGui has gained many essential capabilities including a syntax colouring editor with analysis issue markers, MDI tabs, Find/Replace and Source/Header flip to name but a handful of the more obvious recent changes. 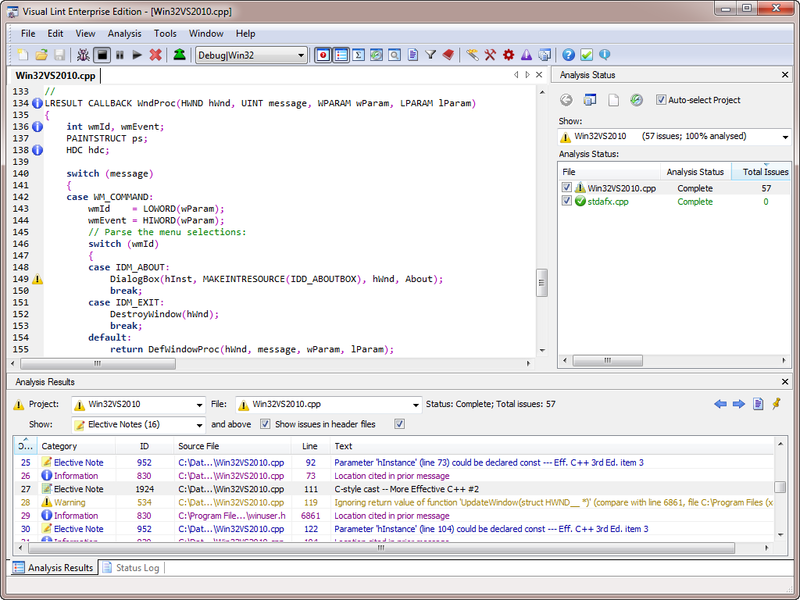 VisualLintGui is currently capable of analysing projects for Visual Studio, Visual C++, Eclipse, CodeGear C++ and AVR Studio 5.0, but it can obviously potentially analyse a far wider variety of codebases than that. Indeed, one of the reasons we have been keen to develop it is to provide a way to support embedded IDEs for which developing a Visual Lint plug-in is not a viable proposition. As such we expect to add support for further project and workspace file formats as and when our customers need them. VisualLintGui currently resides in our Visual Lint development branch, but given the recent pace of development on it we are likely to look at porting it back into Visual Lint 3.5 in the not too distant future. In the meantime we will have a development build on our stand at the ACCU Conference next week, so if you are going please do come and take a look. Although it has been fully functional in terms of analysis functions for quite some time, until recently we were not able to devote a great deal of time to the details of its user interface. That has now changed, and since February VisualLintGui has gained many essential capabilities including a syntax colouring editor with analysis issue markers, MDI tabs, Find/Replace and Source/Header flip to name but a handful of the more obvious recent changes. VisualLintGui is currently capable of analysing projects for Visual Studio, Visual C++, Eclipse, CodeGear C++ and AVR Studio 5.0, but it can obviously potentially analyse a far wider variety of codebases than that. Indeed, one of the reasons we have been keen to develop it is to provide a way to support embedded IDEs for which developing a Visual Lint plug-in is not a viable proposition. As such we expect to add support for further project and workspace file formats as and when our customers need them. VisualLintGui currently resides in our Visual Lint development branch, but given the recent pace of development on it we are likely to look at porting it back into Visual Lint 3.5 in the not too distant future. In the meantime we will have a development build on our stand at the ACCU Conference next week, so if you are going please do come and take a look.